Mr. S.D. Moorthy, assumed the charge as Ambassador of India to the Republic of South Sudan in Juba on 21 st June 2018. Before his assignment in Juba, he had earlier held diplomatic positions at the Indian Missions in Vientiane (Laos), Dubai (UAE), Mexico City, Yangon (Myanmar), Jeddah (Saudi Arabia) and Jaffna (Sri Lanka). He also served in Administration, Gulf and Protocol Divisions of the Ministry of External Affairs, New Delhi. Mr. S.D. 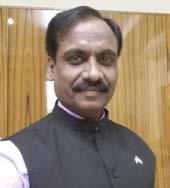 Moorthy did his Post Graduation in Commerce from Madras University and a Diploma in Labour and Administrative Law from Annamalai University, Tamil Nadu. He is married and has a son.